Travel from home each month and experience the pampering you deserve without having to take the time and money to do so! "Escape Monthly was born from the love of travel and relaxation. Each month, we bundle majestic experiences into each box, helping everyone and anyone escape to that place they cherish so deeply in their hearts—their paradise. Each month, members escape to the world’s most luxurious destinations and indulgences, from exotic retreats to the most luxurious spas and from celebrated events to experiences loved world wide. 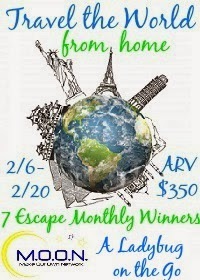 Escape Monthly brings these experiences right to your doorstep." …to Gourmet Snacks & Gift Certificates! All the tools you need to relax, unwind, and pamper! We theme our boxes and these items around our core beliefs, and we define ourselves with three elements: travel, relaxation, and pampering. This giveaway is open to the Continental US only (because of shipping costs) and will end on February 20th, 2014.